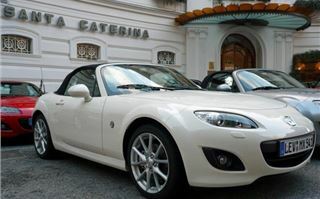 The Mazda MX5 has had a facelift. It’s a bit like meeting an old girlfriend, thinking she looks a lot better than you remember, and not being quite sure why. She went to the right plastic surgeon. Instead of major scalpel work it’s just been a neat nip and tuck. A half measure of botox in the lips. A bit of sculpting around the eyes. A shapelier rear end. And suddenly she’s a new, younger woman. There’s also been a bit of surgery under the skin. The rev limit of the 160PS 2.0 litre engine has been raised to 7,500rpm, allowing it to unleash its full power at 7,000, so you can stay in the gears longer. A new Induction Sound Enhancer makes her a bit more aural when she’s performing. Yet, surprisingly, she’s easier on the wallet. Fuel economy is up to 38.17 mpg and emissions down to 177g/km or 181g/km for the Sport, bringing her one band down in the annual tax. The 1.8i is also improved in this respect, up from 38.7mpg combined to 40.1mpg, and down from 174k/km to 167g/km. 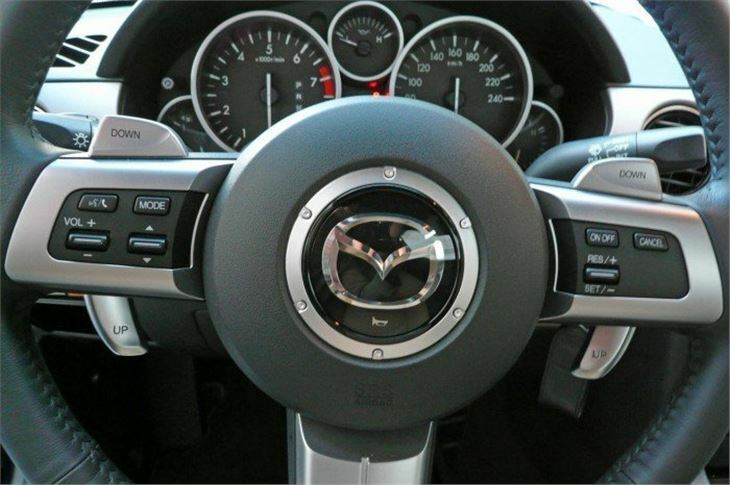 For the second time in Britain, there’s also the option of an automatic transmission with the 2.0 litre engine. 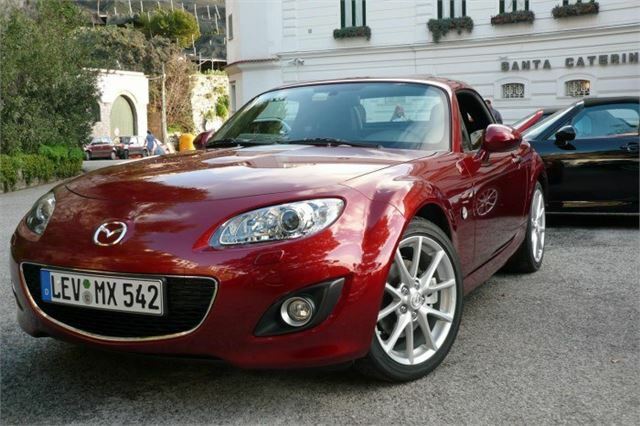 An auto was, very briefly, available in the MX5 Mk II. But the new one is a six-speed, full torque-converter jobbie, confusingly called ‘Powershift’, like Ford’s entirely different box, and with the benefit steering wheel paddleshifters. Possibly one for the ladies, but there were so few autos available on the launch we didn’t get a chance to try it. There’s no longer a base model with plastic hood and steel wheels. The range now starts with a canvas top and alloys. 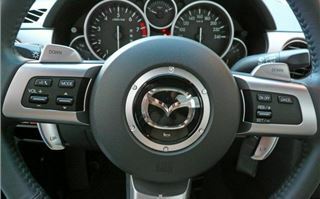 All get a leather covered steering wheel, gearknob and parking brake grip. 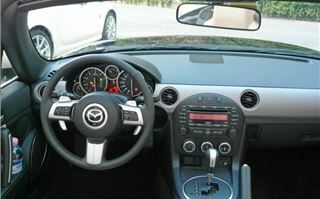 The radio/CD is MP3 compatible and has an aux jack and six speakers. 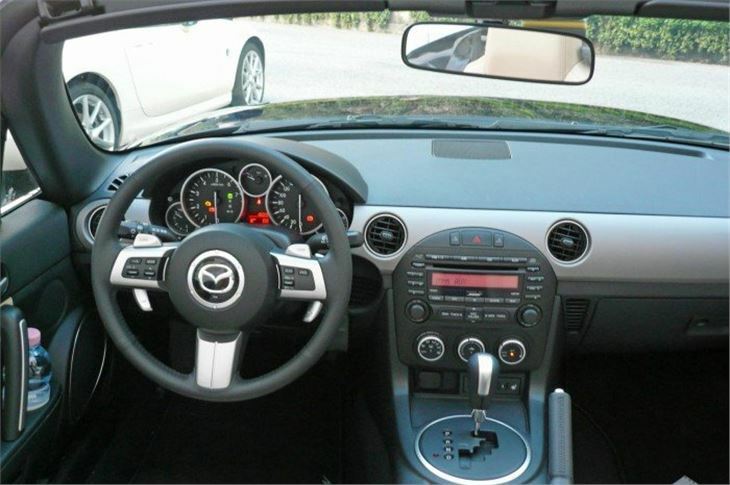 All have revised front suspension giving more linear steering, and Dynamic Stability Control. All 2.0is come with Traction Control and a limited slip diff. 2.0i Sports get Bilstein dampers, 17” alloys with 205/45 Bridgestone Potenzas, front strut brace, 6 speed manual box, front fogs, heated leather seats, climate control aircon, cruise control, a BOSE premium sound system with 6CD autochanger, 7 speakers and a Bluetooth hands free system for your mobile phone. 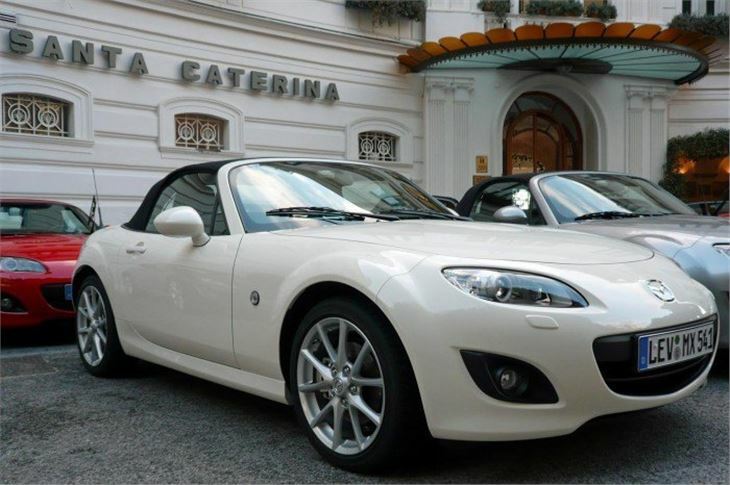 In fact it’s actually an enhanced version of the spec for the 2005 MX5 Mk III Special Launch Edition. 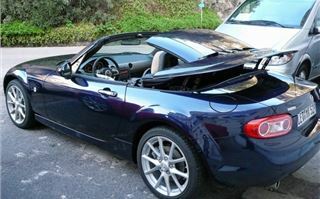 And, of course, instead of a soft-top, you can opt for the ‘Roadster Coupe’ with a hardtop that retracts into a space above the boot in just 12 seconds without interfering with the luggage capacity of the boot. The keeper of the keys had decreed that if we wanted to drive an automatic we had to be Belgian. 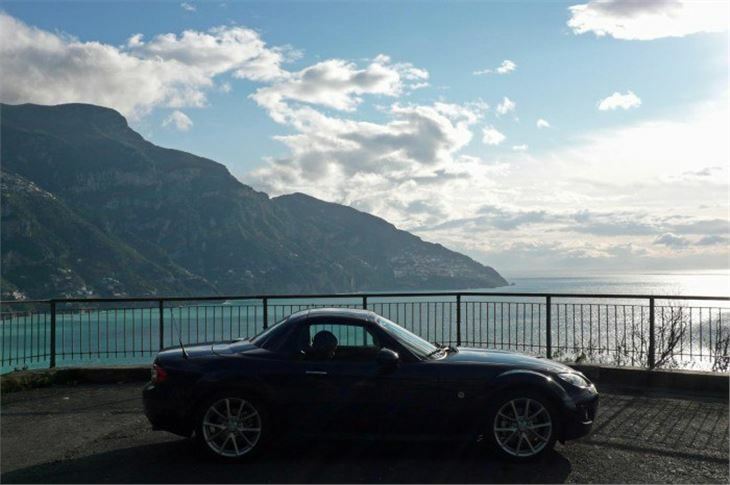 So we left the paddleshifters to the Frites and started our test in 2.0i Roadster Coupe Sport, moved on to a 1.8i Roadster Coupe, and, next day, because some other nation had its towels on the autos, we finished off driving right round the Amalfi coast in another 2.0i RC Sport. On our journeys we encountered every weather condition imaginable apart from sustained, warm sunshine, so the tin tops remained over our heads. The 1.8i was fine, with a much better ride quality on its sensible 205/50 R16 Yokohamas than the 2.0i Sport on 205/45 R17s and stiffer dampers. The adoption of DSC was very helpful because when we hit icy grease on a couple of corners it stopped the car getting seriously out of shape. And really, it’s fine. If you want a fun, sporty car that’s good to drive on real roads whether they’re potholed or not, you don’t lose out with the 1.8i engine and its nicely spaced 5-speed box. And, at £16,345, it’s actually £5 cheaper than the original MX5 1.8i Option Pack was back in 2005. It’s just that if you’re a bit more serious about your sportscars, then you have to have the 2.0i Sport, whether you prefer canvas or tin between your head and the rain. Somehow or other in this one I never found myself in the wrong gear. Second was as low as I needed to go for hairpins to keep the engine on the boil. Third allowed a huge range of speed for just one gear. The engine always pulled cleanly. 6th gave about 24mph per 1,000rpm. The combination was as near perfect as it gets for under £20k. 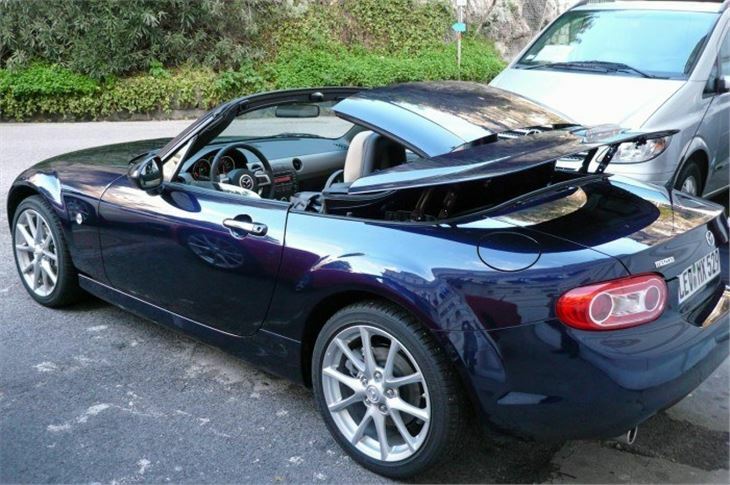 Actually, it doesn’t get better under £30,000, even including the Honda S2000 in your sums. Driving MX5s again the day after the Abarth 500 brings home how much better a good rear-drive sports car can be than anything with front wheel drive. Which isn’t to say the Abarth 500 paled in comparison. It was just a completely different kind of car. 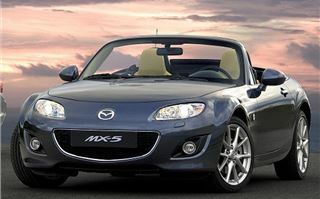 At some time in the not too distant future, I have to take an MX5 2.0i Sport up Gurston hillclimb to see how it handles those two very difficult bends.